Profits For Crystal And Losses For Fred. Olsen – Other Cruise News: Four Voyager Class To Gain 75 Staterooms – Four MSC Ships To Be Lengthened? This week, we report results for Crystal Cruises, which has done exceedingly well in today’s market by making a $23 million turnaround to achieve an $11 million profit for the quarter ending September 30, and Fred. Olsen Cruise Lines, which has done rather poorly by comparison, seeing its loss increase from $6.7 million for the period January 1 through September 30, 2012, to $16.2 million this year. Elsewhere, Royal Caribbean International revealed that it is adding 75 cabins to each of four Voyager Class ships, news that reminds us that each new cabin is worth $100,000 in additional annual revenues to the line. Finally, reports are beginning to appear that MSC Cruises may be about to lengthen their four smallest vessels of the MSC Lirica class. 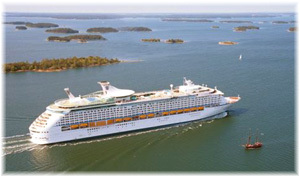 While financial results from the likes of Carnival Corp & PLC, Royal Caribbean International and Norwegian Cruise Line are routinely reported in the media, Cruise Business Online reporter Kari Reinikainen has been busy seeking out details for some of the less obvious cruise lines whose results can still be obtained because they are owned by listed companies. For example, cruise operations of the Japanese company Nippon Yusen Kaisha (NYK Lines), returned to profit in the second quarter of its financial year, i.e. July through September 2013, on a broad-based recovery, as the company reported on its website. Cruise activities account for 1.7% of NYK’s overall revenues and resulted losses of 1.2 billion yen (about $11.7 million) in 2011 and 3.7 billion yen (about $36 million) in 2012, but are now finally showing a turnaround to profit. The group’s cruise division includes Crystal Cruises, based in Los Angeles, with the 1,090-berth Crystal Serenity and 960-berth Crystal Symphony, and Asuka Cruises of Tokyo, which operates the 800-berth Asuka II, the former Crystal Harmony. NYK recorded a quarterly profit on its cruise business of 1.1 billion yen (about $11 million) in the latest period, a complete turnaround from the 1.2 billion yen (about $12 million) loss that it recorded in the same period last year. 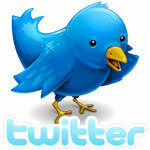 Revenues rose by almost 40%, from 17.9 billion (about $181 million) to 24.9 billion yen (about $252 million). Crystal posted a large year-on-year increase in revenue due to robust sales, particularly for Mediterranean cruises, while sales at Asuka Cruises in Japan were firm due to strong demand for summer cruises. Changes at Crystal in recent times have seen the arrival in 2011 of Jack Anderson, who came from Seabourn, and as Crystal’s senior vice-president marketing and sales has focused on pricing and yield. And last month, Edie Bornstein, latterly with Azamara Club Cruises (and also once previously with Seabourn) was appointed as the line’s new president, replacing Gregg Michel. Anderson has now been appointed vice-chairman and he and Bornstein report to Crystal chairman and chief executive officer Nobuyoshi Kuzuya. Crystal of course also went all-inclusive in the spring of 2012. Meanwhile, through its Norwegian owners, UK-based Fred. Olsen Cruise Lines, operator of four small-to-medium-sized vessels, has recorded a sharp increase in losses along with a slight fall in revenues in the first nine months of 2013, while equity increased, debt fell and the cash position remained little changed. Fred. Olsen reported a pre tax loss of NOK97 million (about $16.2 million) for January through September, almost two-and-a-half times the loss of NOK40 million (about $6.7 million) recorded in the same period in 2012. Revenues fell by about 13%, from NOK1.29 billion (about $215.8 million) to NOK1.12 billion (about $187.4 million), while the line’s operating loss of NOK80 million (about $13.4 million) compared to an operating profit of NOK18 million (about $3 million) in the same period in 2012. Ganger Rolf and Bonheur, the two Norwegian holding companies that own all the shares of Fred. Olsen Cruise Lines, have reported the figures in their own most recent results. Oslo-listed Ganger Rolf and Bonheur are both controlled by the Olsen family. The Ipswich-based cruise line cut interest-bearing debt more than 20%, from NOK1.05 billion (about $175.5 million) to NOK826 million (about $138 million) at the end of September, while cash on hand decreased by about 14.5% from NOK255 million (about $42.7 million) to NOk218 million (about $36.5 million) in the same period. Fred. Olsen is changing its business philosophy by offering more overnight port stays and more short cruises from UK ports. Its 2014 cruise program includes cruises from 10 ports around the UK. 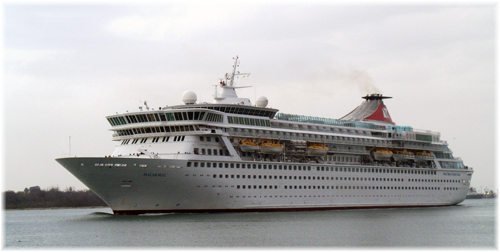 A recent short cruise from Belfast by the 839-berth Boudicca did not receive good reports however. First, it apparently it attracted the wrong crowd – lots of partygoers in addition to regular Fred. Olsen cruisers – and after the ship returned to Belfast at 4:30 am, all passengers were required to be ashore by 6:15-6:45 am – hardly an invitation to return! As Royal Caribbean International continues its ship revitalization programs, next in line for upgrades are four of the 3,114-berth Voyager-class. The Navigator, Voyager, Explorer and Adventure of the Seas will each receive about seventy-five new cabins in upcoming refits. 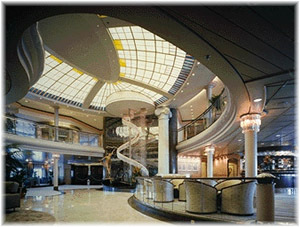 The fifth of the Voyager Class, Mariner of the Seas, was revitalized in May 2012. The Voyager Class actually includes eight ships if we include the three stretched versions of the 3,634-berth Independence class. All were built in the same shipyard in Finland but the Independence Class ships are 95 feet longer and have an extra 260 cabins over the Voyager Class. The refitted Voyager Class ships will now offer 3,264 lower berths, an increase of 4.8% in passenger capacity. While bringing their passenger space ratios down from 44 gross tons per passenger to 42, this is still within striking range of the 42.5 ratios of the Independence Class and above many newer ships being built today. The four Voyager Class ships concerned will receive their new cabins on Deck 12 forward, surrounding the Spa, and Deck 3, aft around the photo gallery, adding a potential $30 million additional revenue per year for the line. All told, the five Voyager class vessels comprise 25% of the line’s capacity. Navigator of the Seas will undergo work during its January docking at Grand Bahama Shipyard. As The Cruise Examiner pointed out in October 2009, it was a Grand Bahama Shipyard executive that first pointed out that the potential extra revenue to a cruise line per new cabin is in the order of $100,000. For seventy-five cabins, that adds up to $7.5 million a year per ship and over four ships this comes to $30 million a year. The Navigator will actually be getting eighty-one new cabins before entering year-round service from Galveston in 2014, meaning in her case $8.1 million a year in extra revenues. All the affected ships will receive the Chef’s Table experience, a Park Café, the popular Italian restaurant Giovanni’s Table, and an Izumi Asian restaurant. On deck, they will receive a new Flowrider surf simulator. 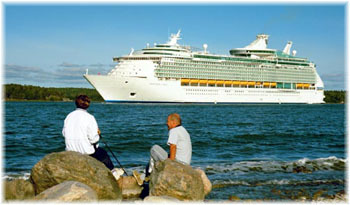 Adventure of the Seas and Voyager of the Seas will follow with similar modifications later in 2014. Four MSC Ships To Be Lengthened? Cruise Business Online has supplied a lot of the news this week, having also alerted us to a newsletter from Sweden’s Shippax that reported that Geneva-based MSC Cruises may be negotiating with Fincantieri to lengthen its four Lirica Class ships. 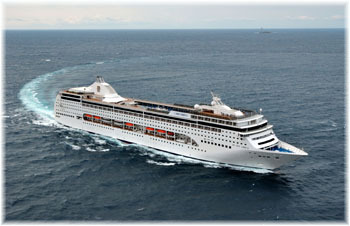 The MSC Armonia, MSC Lirica, MSC Opera and MSC Sinfonia are the ships concerned. MSC Lirica and Opera were built for MSC in 2002/04, while MSC Armonia and Sinfonia were acquired from the liquidators of Festival Cruises after that company went out of business in 2004. All four ships were built by STX France in St Nazaire, the yard that has built all of MSC’s cruise ships since. As built, the four have an overall length of 832 feet and beam of 94 feet and can each currently accommodate about 1,560 passengers. Any lengthening would obviously increase the number of cabins and balconies available but no official announcement has yet been made of any such plans. While on the subject of MSC, the 3,502–berth MSC Divina left Venice on Saturday en route to year-round cruise service from Miami, which is to begin on November 20. In addition to the usual Caribbean winter itineraries, between late spring and early summer MSC Divina will offer some longer 19-night cruises between Miami and Brazil with calls in the West Indies in each direction. 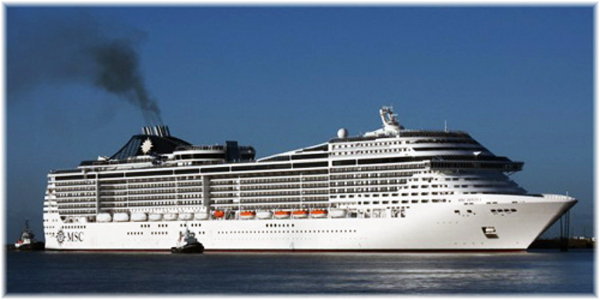 MSC Divina was originally ordered by Libyan interests but taken over by MSC Cruises while she was still under construction and completed largely to their Fantasia Class specification in 2012. The new ship is more than a third larger than the last US-based ship, the 2,550-berth MSC Poesia, which operated on a seasonal basis each winter.